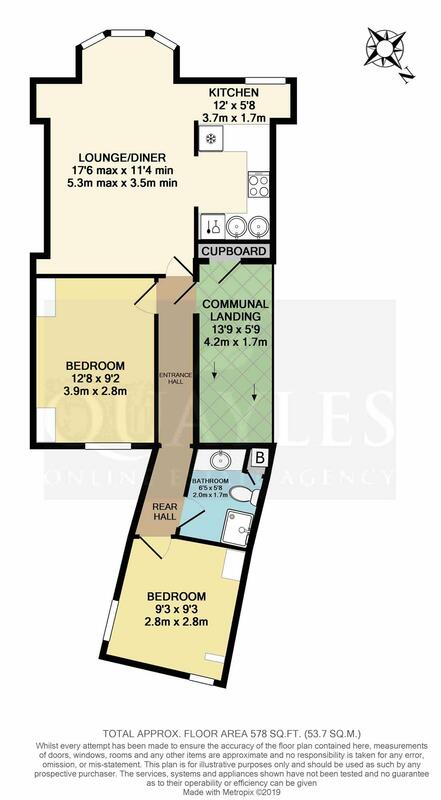 A Spacious 2nd Floor Flat in a Convenient Location Enjoying Pleasant Frontal Views. A Short Walk from Ramsey Town Centre & Queens Promenade. On Main Bus Route. A South West Facing Property Receiving Maximum Sunshine to Principal Rooms. Offered in Excellent Decorative Order Throughout with a Contemporary Finish. Communal Entrance Area & Private Storage Cupboard. Intercom Access. Bright & Spacious Lounge/ Diner, Semi Open Plan to the Kitchen & Breakfast Areas. Stylish Shower Room Plus 2 Double Bedrooms, Both With Built In Storage Solutions. Gas Fired Central Heating & uPVC Double Glazing with Bespoke Blackout Blinds. Active Management Company in Place - Offered with Long Term Sitting Tenant. From Parliament Square travel out of Ramsey town along the A18, taking a right turn onto Albert Street and continuing onto Waterloo Road. Stanley Mount West will be found a short distance along on the left, just after the turning to Queens Drive East. Flat 4 is located on the 2nd floor. Cupboard housing the electricity meters. Post boxes. Stairs to the upper floors. Private storage cupboard - the stop tap is also located here. Door to flat 4. Intercom handset. Consumer unit. PIR lighting. Heat detector. Double power point. Doors to the main living space and bedroom 1. A short flight of stairs leads down to the lower landing. A superb, naturally bright room with a uPVC bay window to the front with bespoke fitted black out blinds and additional cafe blinds. The ideal location for a small dining table and chairs, enjoying far reaching views across Ramsey town to Albert Tower and Skye Hill. Two shelved recesses. Multiple power points. TV and satellite points. Period style radiator. Quality wooden flooring continues through clear openings to the kitchen and breakfast areas. Fitted with a good range of light wood effect, wall and drawer line base units together with laminate worksurfaces and steel upstands incorporating a circular sink and drainer together with a lever mixer tap providing hot, cold and filtered water. 'Competence' electric fan oven with an inset four burner gas hob above, brushed steel splashback and an 'AEG' extractor. Concealed washing machine and integrated fridge. Recessed downlights. Smoke detector. NB Measurement includes the separately accessed breakfast area. A large, arch top uPVC provides views to Skye Hill. Bespoke fitted blackout blinds. Breakfast bar. Traditionally styled radiator. Recess with stainless steel display shelf. Space for a storage unit or additional appliance. A good size double room with a deep set uPVC window to the rear, fitted with bespoke, wipe-able, blackout blinds. Having a useful built in storage space incorporating hanging space, high level shelf, study area and space for a 5ft bed with niches and recessed light. A deep set window fitted with a bespoke blind provides natural light. A well planned space with an illuminated niche fitted with a shelf and top mounted circular basin together with a glass shelf and mirror. Push button flush WC and a corner enclosure housing a fully plumbed shower. Built in cupboard to the corner concealing a 'Vaillant' gas fired combi boiler. 'Domus' extractor. Traditional style radiator. Tiled floor. A further double room with two deep set uPVC windows and bespoke fitted blinds. Built in bed surround incorporating display niches, recessed lighting and a high level shelf together with an open fronted wardrobe. Ample space for a 5 ft bed. 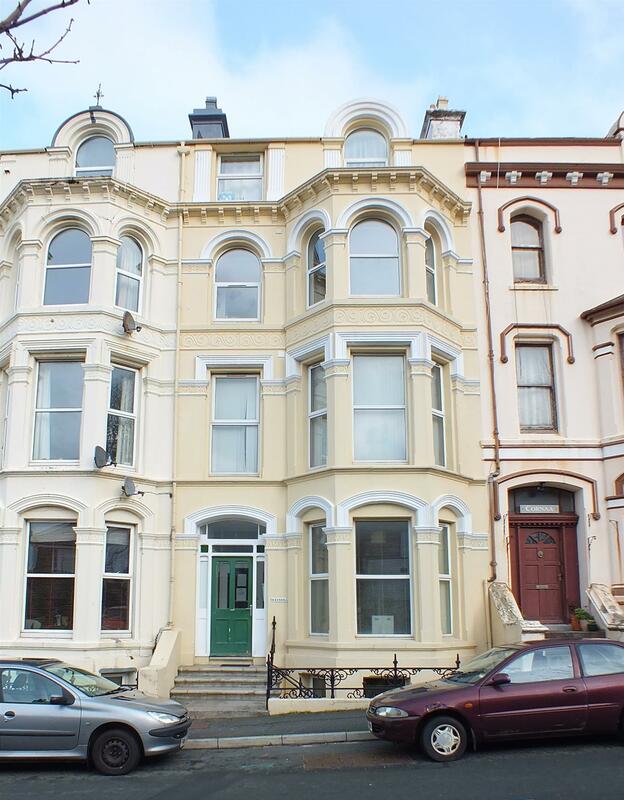 The property is a short walk from both Ramsey town centre and the promenade which features the historic Queens Pier. Leasehold - Active management company in place. Greenhill Management Company Ltd - 999 years from November 2002. Managed by Point2Point property management services. £1400 per annum - year end 30th September. Bespoke fitted black out blinds, carpets and floor coverings.